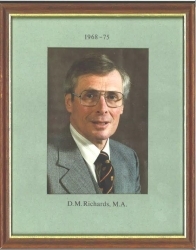 The Club has been informed of the death of former headmaster D M Richards 1968-1975. David Richards was born in Bath in 1931 - on the day the Anglican Church dedicates to all saints of England – into a Wiltshire medical family, based at Westbury. After early education at home, he attended Salisbury Cathedral School during the war years. There he won a place as a chorister, his musical education being nurtured by Sir Walter Alcock, the famous organist, then in his eighties who had played at the coronations of three kings. Alcock’s organ compositions - which featured prominently in David’s seventieth birthday organ concert, played by Roy Massey in Hereford Cathedral – these compositions were to remain one of his musical passions throughout his life. David’s time at Salisbury, which no doubt included rides on Alcock’s model railway, was both happy and successful, his leadership qualities being recognised in 1945 by his twin appointments as Bishop’s Chorister and captain of cricket. David was equally successful at Cheltenham College: as a music exhibitioner, brass player in the college orchestra and band, and chapel organist; under-officer in the CCF and College prefect; and as an outstanding sportsman. He played in first teams for three sports, captaining cricket in 1950. During his three years in the XI, he never lost to Haileybury at Lord’s, where the match was then played. This must have given him certain bragging rights when he became a Haileybury master in later years. But first there was the question of his higher education. David had secured a place at Magdalene College, Cambridge - where his uncle I A Richards, the great literary critic and rhetorician, was a don – but this was deferred, first by national service with the Royal Artillery, and then for a further two years as a London medical student. His hope to follow his father into medicine, however, did not materialise – in his own typically self-effacing words ‘he didn’t work hard enough’, although given his Arts Higher Certificates, it would have been difficult for anyone at that time to have converted to the sciences – and he took up his Magdalene place in 1954. At Cambridge, he played a lot of cricket (just missing out on a ‘Blue’) and I suspect spent a little less time reading English and Theology for the Tripos, but he gained his BA degree in 1957. So began his 26 year career as a schoolmaster and headmaster – in the three counties (as he liked to joke) of ‘Artford, ‘Ereford and ‘Ampshire. For eleven years (again in his own words) ‘of relative abandon’ at Haileybury, David taught English and Theology, ran the cricket, house-mastered and made music. April and August holidays enabled time for MCC, club and minor counties cricket – including the captaincy of a strong Wiltshire side which achieved two challenge matches during his time, the second at Old Trafford against Lancashire. It was at Haileybury, too, that David met Margaret Coldham, a former Great Ormond Street nurse who was working in the school sanatorium. Their relationship blossomed and they were married on 10 August 1966, a marriage that lasted nearly forty years until Margaret’s sudden death in February 2006. During their time together, Margaret was a source of strength and inspiration for David, not only in bringing up their children and creating their family homes – some eleven of them - but also supporting him in his professional roles where her gift for engaging with people at all levels was so admired. With their growing family, not the least demanding of Margaret’s roles was her support for David at Hereford, where on 6 March 1968 – despite Margaret’s unavoidable absence at the final interview as less than three weeks earlier she had given birth to Jim – David was appointed headmaster of Hereford Cathedral School. At 36, he was the school’s youngest headmaster of the century. More importantly, as Dean Price publicly confirmed, he was ‘a dedicated master, who would value the traditions of the school and be open to new ideas of the time’. And (as David later wrote), at a time of ‘uncertainty, challenge and change’ for direct-grant schools, the new ideas that David helped implement – the admission of girls, the extension of the governing body, the election of a bursar (for hundreds of years the school had been administered by the chapter clerk), the appointment of the school’s first director of music, the founding of a chorister boarding house and the launch of an appeal – all these initiatives placed HCS, in a relatively short time, on a much firmer foundation. Nor at a time of proper teaching Heads should David’s inspiration as a classroom teacher, with a particular enthusiasm for Shakespeare and Milton, be forgotten. At his leaving in 1975, David had successfully steered HCS through the tribulations of the late sixties and early seventies. That it was a more open and less stuffy establishment, at greater ease with society and itself, was in no small measure due to his leadership and example. A similar pattern emerges from David’s eight years as a reforming headmaster of Portsmouth Grammar School, the alma mater of his cricketing hero Wally Hammond. At Portsmouth, he led an appeal and oversaw the 250th anniversary of its founding; he opened a pre-preparatory department; he both fostered the improvement of music and introduced new subjects to the curriculum; he steered through the abolition of Saturday morning school; and he admitted the first girls to the school – in retrospect David himself regarding those early co-educational steps as the most important landmark of his tenure. It is significant that on his last visit to PGS in March 2015, he was not only pleased to see co-education flourishing but also delighted to witness the crocuses blooming and the walnut tree planted in his time in full growth – a permanent symbol of his humanising of the school. It is equally significant that in the last of his many letters to The Times, published just over a year ago – and in support of one that I had written a few days earlier – David pointed out how the former direct-grant and assisted places schools had contributed to social mobility. David strongly supported an educational system which provided a bridge between private and state sectors. Following Portsmouth, for six years (1983-89) David was principal of Brathay Hall Trust, a charitable organisation at Ambleside that supports management education training, a field studies centre and an exploration group. At Brathay, his commitment to young people to improve their life chances and develop their potential was also evident. As the chairman of David’s governing board told me, his was a ‘very steady hand’, marrying the intellectual side of behavioural analysis to the physical demands of outward-bound activities. Through new initiatives, at a time of intense competition from other organisations, he ‘kept the place alive’. And so to David’s final 27 years – a long and fruitful period that can hardly be called ‘retirement’ such was his busyness. He organised school appeals, including those for RGS Guildford and Hereford Cathedral School, where he helped raise the remarkable sum of £400,000 for a new Technology centre at a time of economic depression in the early 1990s; he became an educational consultant to Prince Henry’s School, Evesham, again assisting in the process of constitutional change as the school moved towards grant-maintained status; and he put his considerable skills as a composer, poet and writer to good use by proof-reading texts for the Tate, Pearson Education, SPCK and other organisations. David also, of course, made time to pursue his own interests. At golf, he achieved a handicap of six in his early seventies and invariably won our annual challenge match at Puckrup. He was especially pleased that on his best form he could go round the golf course in less than his age, rightly boasting that it was something that Tiger Woods and Rory McIlroy had never done. He regularly attended Test matches at Lord’s, queuing in the early hours to gain his favourite seats in the Allen stand, one of which was usually reserved for Richard Lloyd. He was an art enthusiast, periodically visiting the National Portrait Gallery, the Tate, the Wallace collection and the house of Samuel Johnson – another hero. Such visits might also include Handel’s house in Brook Street, and as this signifies, it was music – the activity which David practised from his earliest days learning the violin with Dorothy Dalrymple of Bratton – that became his predominant interest in retirement: as a long-standing member of this church’s choir, Cantus and the Wheatsheaf consort; and as the founder with Laura, with whom he shared many interests in his later years, of the Barnsford singers. But there are three other golden threads that have run through the latter part of David’s life: his children, of whom he was justly proud. Jim, living in Faversham with his wife Jo and three children, has undertaken a career in transport and is a director of one of the leading international transport consultancies; Lucy, who lives in Shepshed with her partner Barbara and their dog Holly, has pursued a varied career, including time as a driving instructor, work for DHL and more recently as a carer; and Matthew, now living in Cheddar with his wife Sophie and their four children, runs a well-established and successful European business. The varied course of their lives, the happiness in their personal relationships and the joy in the arrival of the seven grandchildren gave David enormous pleasure over many years. Finally, if I may end on a personal note, it was music that bought David and myself together for the last time – last October in Llandaff Cathedral, where I had the privilege of singing three choral services with the Wheatsheaf consort. Standing next to David in the choir stalls on Decani in that place, I marvelled at both his musicianship and his ability to sing the weekend offices in a sweet baritone voice in his mid-eighties. That was the last time we met, but not quite our last communication, for I received his Christmas card – with a signature as clear as it had been when he signed his Hereford governors’ reports nearly fifty years earlier – a card which featured three magi as depicted on a sixth century church mosaic in Ravenna. This photograph, incidentally, was taken on one of his two trips last year to Italy, a country which he particularly loved. So as it was fitting that David was born on the day dedicated to all English saints, it was also appropriate that he died on the feast of the Epiphany. For David was a wise man, a good and loyal friend and, above all, a devoted husband, partner, brother, father and grandfather. May David rest in peace with the saints, and in this Epiphany season, ascend to the heavenly choir.